I wanted to read The Troop as soon as I put my eyes on the cover. A horror story set up in Prince Edward Island? I had to read this! 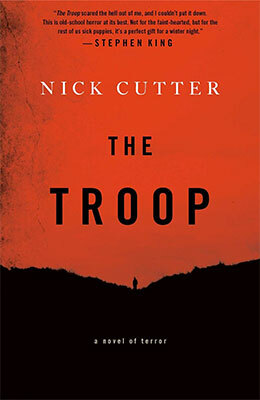 The premise of The Troop is a very classic one: a few people – one adult and five teenaged boys – end up stuck on a remote island with no means of communication with the outside world and an unknown but deadly danger looming on them. And finally, you jump right beside Scoutmaster Tim Riggs and the five boys enjoying themselves on a vacation. Right off the bat, I thought “ok, the hungry man is going to EAT THEM ALL.”. And well, The Troop is a survival horror novel and although the genre has been overdone, this novel brings its share of good surprises. In The Troop, horror raises from everywhere. The hungry man is the obvious outside threat but as fear falls upon the group of Scouts, friendship and trust falls apart and people become a threat to each other. No dread is spared to the kids: starvation, extreme weather, disease, and the panic of not knowing, not understand what is happening. I really liked that the danger didn’t only come from one outside evil, but started popping up in all directions like poisonous mushrooms. Another aspect I really enjoyed was the character development of each boy. In some ways, The Troop reminds me of “It” by Stephen King, where each kid’s personality is scrutinized and plays a specific role in the plot (I even wondered if the scary clown mentioned at the Cavendish County Fair with his balloons was a reference to It, actually). In The Troop, there is a bit of this: each boy has a specific set of traits and the plot develops as fear and danger rebalance the importance of these traits and how they interact, shifting power within the group. I felt it was a bit stretched to a cliché, especially for the fat-nerd-geek bullied boy and the muscled-and-dumb policeman’s son, but it was interesting to have a peek at each character’s story and how it made the boys relate to each other. There was also something about how people in Prince Edward Island behave… even though I’m not sure it’s so much in their favour! [He] had been killing things for a while by then – although he didn’t think of it as killing, per se. Other creatures, even people, were empty vessels. Of course, not physically empty: all living things were packed full of guts and bones and blood that leapt giddily into the air when it was released from a vein. But none of them had an essential… well, essence. They were just ambulatory sacks of skin. Unfortunately, I also found a few draw back to The Troop. One of them was the total lack of suspense. True, it’s a survival horror, and most stories in the genre follow the same mechanics (people dying, I mean). But still. The boys were a bit too predictable. Besides, Nick Cutter chose to explain the outside threat (“the hungry man”) through documents such as interviews and newspaper clippings. This format allows to cool down a bit between tensed chapters, but I found their coldness disengaged you from the story and furthermore, they leaked too much information. Worst, they reveal those information in a very flat and anti-climatic way. Finally, sometimes I felt like the novel tried too hard. It’s a horror novel and it should be scary, but sometimes it doesn’t have to be shocking at all cost. There is for instance a long account of how one of the boys used to torture animals in the past, and the very gritty details of how he tortured a kitty. It wasn’t easy to read and I thought it was a cheap way to make the reader feels uncomfortable. In the end, I found The Troop rather scary and certainly enjoyable. I loved that it was taking place in Prince Edward Island (I wish I could go there!) and I liked the setting. On the other hand, I felt the horror tend to diffuse at the end, and I wish there had been more suspense to keep me interested in what was happening.